Once of the best small defenders in the AFL, McCabe was a much-maligned player who saw his career cut short by injury. 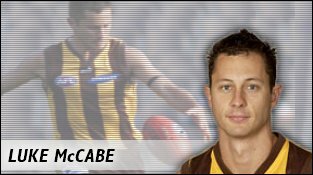 Making his debut in 1995 after being drafted with the 15th pick in the 1993 National Draft, McCabe went from mistake-riddled kid to tight and skilful leader. He played very tight and always with 100% commitment. It was this commitment that led him fracture his collarbone in a collision with Melbourne captain in the opening round of 2002 – an injury from which he never really recovered. Eventually the shoulder popped out one too many times and McCabe retired at the end of 2004.